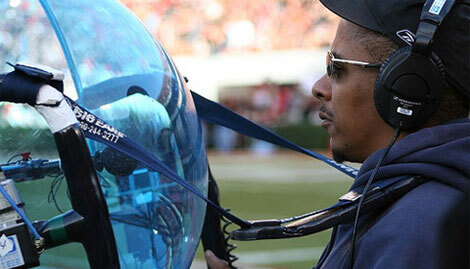 Eye On Sports Media: So This Is Why FOX Sports Shows So Many Band Shots on BCS Games? So This Is Why FOX Sports Shows So Many Band Shots on BCS Games? One of the biggest criticisms of FOX Sports coverage of BCS Bowl games is the over the top number of crowd and band shots. The only scratch your head reason people could come up with was that no one could understand why it was happening, or is that FOX just did not know how to cover college football. Well the latter may not be the pure reason, it looks like it factors into the reason more than we might think. In the end, it is all about the audio. Audio for an NFL game looks to bring the viewer closer to the action on the field. But during the next two weeks, when college football and the BCS take center stage for pigskin fans, mixers will instead look to make fans at home feel as if they’re in the stands. “The pep bands and the noise of the crowds are really the big audio elements of the BCS,” says Fred Aldous, senior audio consultant for Fox Sports, which will do its fourth turn at the bowl games. During that time, the Fox crews have refined how to approach the key differences between collegiate and NFL contests. ...“We’re looking to get a kind of overall wash of crowd noise rather than specific or direct sounds,” Aldous explains. While the crowd and pep bands provide a consistent and percussive sound layer to support the game action, the loss of the umpire microphone is significant in terms of what kind of detailed sound elements can be included in the mix. Some of that can be gotten back from the four parabolic microphones working the sidelines, which pick up elements like referee whistles and even some of the quarterback cadence and line crunching. “It’s not enough to make up for [the umpire microphone], but it definitely results in a different approach to mixing from an NFL game,” says Aldous. “We bring the crowd out more in the overall mix.” It affects POV, as well; Aldous will usually place the nearside audio sources in the stereo field and the far side sources in the surrounds. It can even affect the visuals. “When the sounds in the stands surge, it helps guide the director towards more crowd shots and pans,” he says (emphasis added). So here we may have a plausible reason for all of the crowd and band shots. The NFL production teams that FOX Sports uses for the games may be trying to compensate for the loss of what they are used to doing week in and week out. But it does not take away from the fact that they are overdone. When fans are sitting in the stands, they are not spending their time looking around at all the other fans in the stands. They are not wondering what the band is doing at the stands between plays. They are watching the video replays on the scoreboard or listening to their portable radios. The bottom line is that the ambient sound of the game can tell the background story without killing viewers with too many shots towards the stands. Instead, FOX Sports should save those shots for commercial bumps, and these shots should be a replay of some important play or sequence that happened since the last break, cheerleaders, or the band(s). But they should not ruin a game broadcast during the game itself. It is the noise that is making the difference, the noise generated by a mass of thousands, not by the few faces caught by the camera.